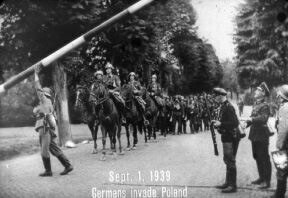 September 1, 1939 a vanguard of the German Army raises a border gate and begins a long-prepared war of aggression. Poland, the first victim, had delayed general mobilization to avoid antagonizing Hitler. His army wins a quick and overwhelming victory. September 6, 1939 the first of Britains troops fulfill her promise to came to the aid of Poland, though until the last minute every possible effort of the British government is employed to dissuade Hitler from war. 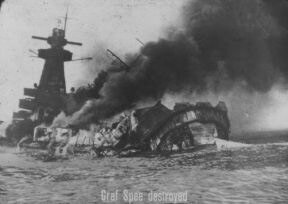 Within three months the first spectacular naval action at sea takes place in the south Atlantic, when the German pocket battleship Admiral Graf Spee. is attacked by the British cruisers Exeter, Ajax and Achilles. The Spee is driven into Montevideo Harbor. 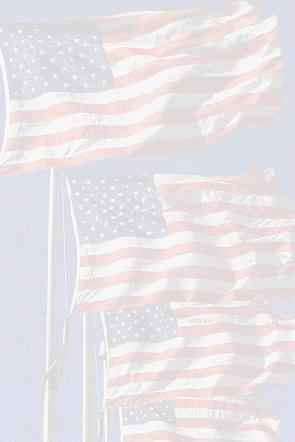 but, ordered to leave, is scuttled on orders from Berlin. 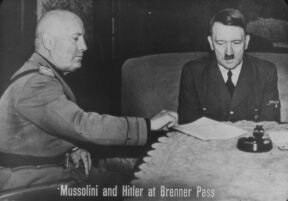 Mussolini, Fascist dictator of Italy and Adolph Hitler, hold their first wartime meeting at Brenner Pass in March of 1940. No record exists of their conversations and agreements. but in June the Italian dictator was to announce from his balcony that he had entered the war against France and England. When the full force of the Nazi war machine sweeps into Belgium. King Leopold. convinced the fight is hopeless, surrenders his armies in May. 1940. The British. their left flank suddenly exposed. 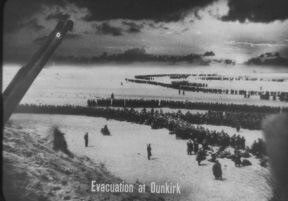 retreat to Dunkirk, their one remaining channel port and every small boat and ship that can cross the Channel accomplish the miraculous rescue of 335,000 men. 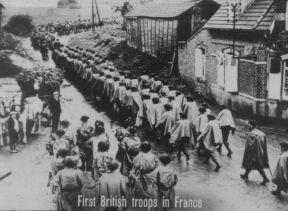 The French Armies still in the field, withdraw to a line south of Paris to save the city from destruction. 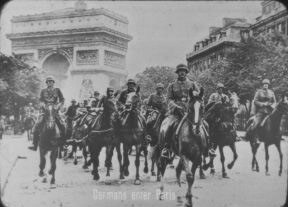 On June 14 the German columns pass through the Arc de Triomphe in entering the silent, deserted city which had last yielded to them in 1870.